The new and improved version of popular monthly disposables Purevision 2HD, these contact lenses are for those who demand impeccable clarity of vision from morning til midnight. Custom engineered to combat the effects of the sun's glare, halos and blurred vision, Purevision 2 are unique lenses that perform exceptionally well in all light conditions, particularly low light. If you spend alot of time sat in front of a computer screen and need a high performance lens designed to handle the demands of modern life, this is an excellent place to start. 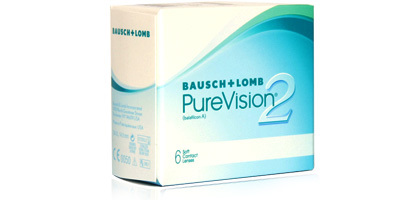 It's not just continuous sharp and clear vision that makes Bausch & Lomb Purevision 2 lenses a smart choice. Despite being one of the thinnest monthly disposables available, these contact lenses are remarkably comfortable, easy to handle and durable. They supply the same level of vision and comfort on day one as they do on day 31. Pop them in and forget about them until bedtime. 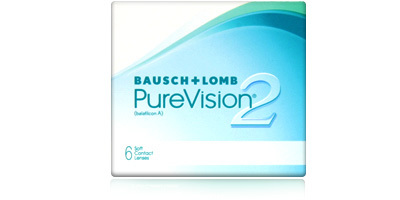 Bausch & Lomb's unique Comfort Moist technology supplies excellent breathability. These silicone hydrogel lenses allow oxygen to pass through easily, keeping eyes naturally hydrated, clear, bright and healthy. A slight blue tint makes Purevision 2 monthly disposable lenses easy to see, both in and out of solution. The solution in which the lenses are packaged contains a strong moisture-rich agent called poloxamine, which makes application fast and easy. If you have any questions about any of the monthly disposable contact lenses featured, call us on 0800 037 4000. 98% of products are shipped on the day of order placement.